In recent years, enhancements to the dimensional shingle have resulted in a new generation of high-quality asphalt roofing products with distinctive and often dramatic appearances. With these advancements came a new name: architectural roofing shingles. Also known as laminated or dimensional shingles, architectural roofing shingles are among the highest quality roofing products. Traditionally, the shingles are composed of a heavy fiber glass mat base and ceramic-coated mineral granules that are tightly embedded in carefully refined, water-resistant asphalt. Recently, however, a new product has surfaced on the market – synthetic slate. Synthetic slate is an innovative roofing product that simulates the appearance, texture and contours of traditional natural slate. It is a carefully engineered polymer composite roofing product that is formulated for beauty, durability and handling. Architectural roofing shingles provide a stunning three-dimensional appearance. Some of the most attractive architectural roofing shingles simulate cedar wood shakes. These shingles are quite thick with random slots similar to real shakes. Another unique architectural shingle design imitates the look of slate without the weight issues that normally accompany those materials. 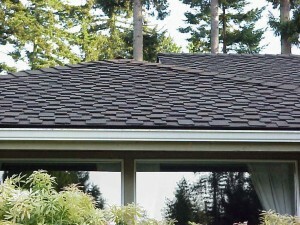 These architectural roofing shingles do not require any additional roof support as slate would. The products’ random colors and textures better accent steep roof planes, turrets and gables features of roofs. Many product lines offer hip and ridge pieces that highlight a roof’s many sections and complement the shingle. New trends extend beyond mimicking the look of natural products. Because of their extra thickness, architectural roofing shingles weigh considerably more than conventional asphalt-based shingles and have longer warranties. Weights run up to about 480 pounds per square (100 square feet of roof area) and can carry up to a lifetime warranty. Besides offering a surplus of good looks, most asphalt architectural shingle products have a design feature that helps prevent a common aesthetic problem: black streaks caused by algae. This is commonly seen on roofing shingles in areas with high humidity and rainfall totals. Algae-resistant shingles are coated with copper or zinc granules, which leach over time, inhibiting algae growth. Because of their greater thickness, architectural shingles have better wind tear-off resistance. Some are rated at 120 miles per hour. They are also highly fire resistant especially if they have a heavy granulated top coat. A heavy layer of top coat granules provides the highest fire rating of Class A.